Discover awesome intelligences as tools to solve problems in innovative ways!Complete this 40-item survey and get ready to see ordinary facts - through extraordinary lenses - in your own brain! It’s fun, free, and quite straightforward, as you check off at least 15 statements which best capture personal interests and abilities. Learners become familiar with their strengths and also being to spot their weaknesses. Learners compare checked items to those listed in the Mita survey key, and they find clues about their strongest intelligences, and suggestions to develop weaker skills. Using this survey, students use more unique intelligences as an asset to learning, leading and retaining new facts. The award winning Mita problem-solving-method represented here relies on personal capabilities as tools to solve real life problems in innovative ways. Mita is one of the only brain centers named and listed in Dr. Howard Gardner's book, INTELLIGENCE REFRAMED (Basic Books). Students will unleash hidden or unused intelligences to help them succeed in achieving course related goals. They will be steered toward new talents for solving real life problems. Typical strengths listed here are adapted from my book written for parents and teachers: Student Assessment that Works: A Practical Approach, pp. 17-19. The book, originally published by Pearson’s, is now located at http://www.teacherspayteachers.com/Product/Mita-Strategies-in-the-Classroom-and-Beyond . as daily reminders for students to use new approaches to understand and apply new facts in your classes. 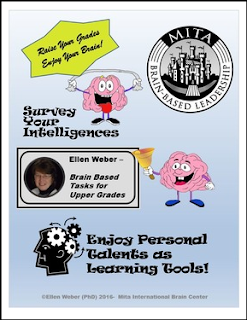 Hopefully these ready-to-roll brain-based materials will benefit your learners and leaders as they do mine at middle, secondary, university levels and beyond.